MOREHEAD CITY – A little more than 30 visited the state port here Monday for a glimpse of the construction of a large-scale oyster restoration project. 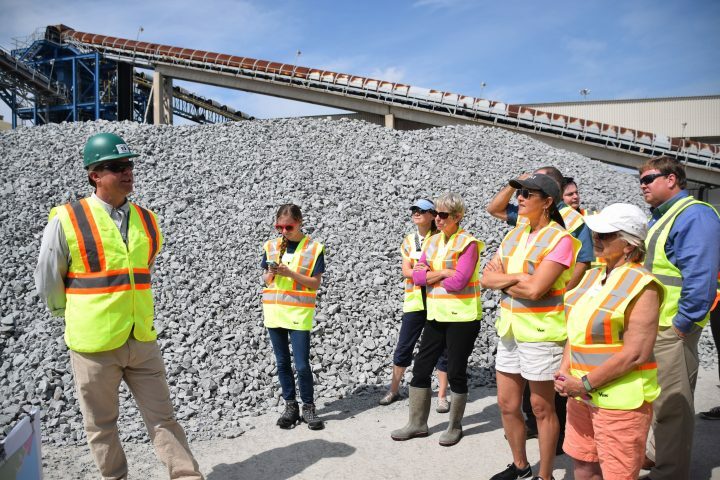 Representatives from the North Carolina Coastal Federation, North Carolina Division of Marine Fisheries, North Carolina Sea Grant, the National Oceanic and Atmospheric Administration and other partners were joined by the media and citizens for the behind-the-scenes tour of the port. The port is the staging area for year two of the three-year Swan Island Oyster Sanctuary project that’s part of the Sen. Jean Preston Oyster Sanctuary Network, a system of oyster sanctuaries. In March, 25,000 tons of granite were delivered to the port for the project. The Swan Island Oyster Sanctuary in Pamlico Sound near the mouth of the Neuse River is the largest project of the federation’s 50 Million Oyster Initiative, which aims to restore 50 acres of oyster reef by 2020. In the first year of the project, 15 acres were built. Ten more acres are expected to be added this year. An oyster sanctuary is created by building reefs on previously viable oyster-producing sites using material that attracts oyster larvae. 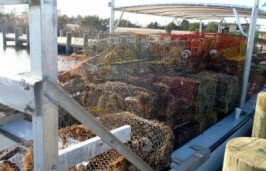 Sanctuaries are closed to harvesting, which allows for the oysters to develop. The second phase of the Swan Island Oyster Sanctuary began May 11 and is expected to be complete by the end of June. Stevens Towing Co. based in Edenton is transporting the material to the sanctuary site from the port. Jason Peters, reef enhancement program supervisor with the Division of Marine Fisheries, who oversees the oyster sanctuary program and other artificial reef work in the state, told the group that oysters are important because they serve valuable functions that include wave attenuation and carbon sequestration. They also provide an economic benefit because of their value as seafood, provide habitat for different marine organisms and their capacity to filter water helps keep waterways clean. The division in 1996 instituted the oyster sanctuary program and has built 15 sanctuary sites, mostly in Pamlico Sound, that range in size from a few acres to more than 70 acres from Roanoke Island down to areas in the mouth of the Neuse River. Simon Rich is the North Carolina general manager for Stevens Towing. He said the process involves loading the barge with 1,500 tons of material at a time and deploying to the reef site to place it. He anticipates that taking 16 or 17 days and they’ll spend about the same number of days loading the barge, with the hope to complete this section in two months, weather permitting. Kaitlin DeAeth, oyster sanctuary biologist at the Division of Marine Fisheries, explained that the material is placed using specifications that maximize the space and other factors. She said the length of time it takes to become a functioning oyster reef habitat depends and marine organisms such as finfish could be at the artificial reef within a day. They hope that during the spawning seasons, oyster spat will float through that area and catch on the rock material. The division will likely complete a full assessment in August. Peters added that there’s typically two spawning seasons, the spring and fall of each year. In addition to the oyster sanctuary program, the division also heads up the cultch-planting program. Cultch is oyster shell, limestone and other shell material that oyster larvae, or spat, colonize. Oyster sanctuary sites and cultch-planting sites are built where they can interact with one another. As part of the division’s cultch planting program, they build about 40-60 acres of reef every year that are lower in profile and open to harvest, Peters said. While they may be spatially separated, sanctuary sites and cultch sites are connected by currents. “We try to position oyster sanctuary sites in areas where the cultch planting sites can benefit from the larvae coming off of it,” Peters explained. 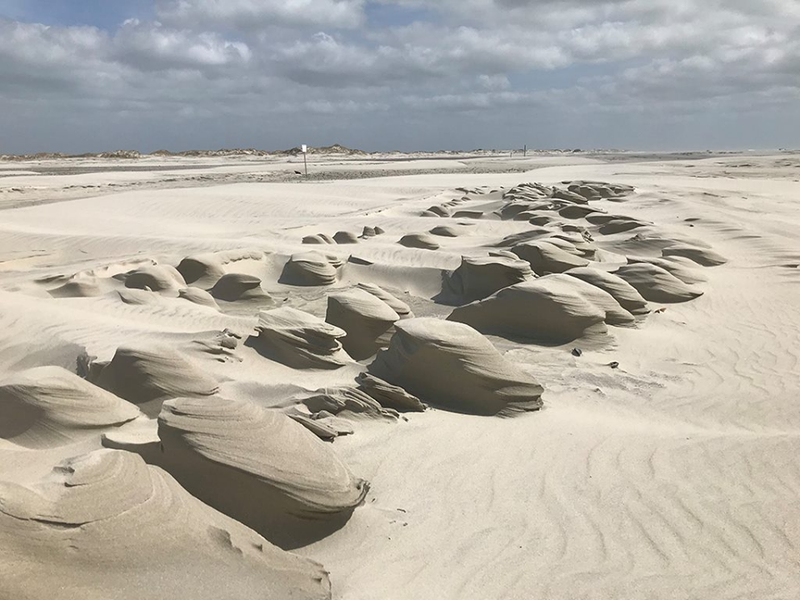 Peters said the reason granite rock is being used this year is because it is more dense, and therefore less susceptible to some environmental pests that occur in the Pamlico Sound. The main pest being the marine boring sponge that can drill into and live inside calcium carbonate rocks, and are detrimental to the survival of oysters. The granite is harder and doesn’t harbor that environmental pest. Limestone marl has been used since the oyster sanctuary program began in 1996. In some cases, they have seen a fair amount of boring sponge at those reef sites. This is the first time granite rock has been used at such a large scale, Peters added. A grand total of 25,000 tons, or 50 million pounds of granite is anticipated to be used to build the 10 acres at the reef site. 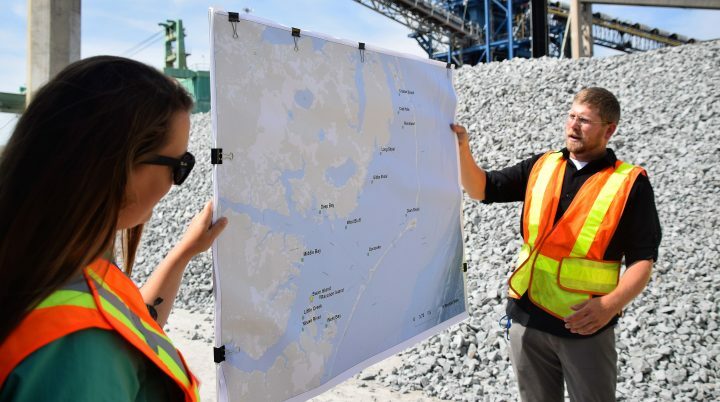 Peters said that the division expects about 10 million oysters from this year’s portion of the project, added to the 15 million oysters on the 15 acres created under the project last year. Steve Murphey, the division director, told the group on the tour during a recap later at the N.C. State Center for Marine Sciences and Technology, or CMAST, building in Morehead City that what they saw at the port was probably one of the biggest public-private partnerships in which he’s had the opportunity to participate. Ken Riley, a fisheries biologist with the NOAA Beaufort lab, followed by saying to expect this fall an announcement regarding the North Carolina Shellfish Initiative that will focus on restoration and aquaculture. Miller further explained the shellfish initiative, saying there is a move afoot to designate North Carolina as a shellfish initiative state, one of a handful in the country, and there are plans to unveil parts of this initiative in early August. Riley said later that North Carolina would join Rhode Island and Connecticut in the national program, the only states on the East Coast participating. Erin Fleckenstein, a coastal scientist with the federation and manager of its northeast office in Wanchese, said the behind-the-scenes tour was a way to show the full picture of what is needed to build an oyster sanctuary. She explained that it takes partnerships to restore the oyster habitat in North Carolina and there’s a great partnership taking place in the state that blends national, state and nonprofit research and marine contractors to help build the oyster population. 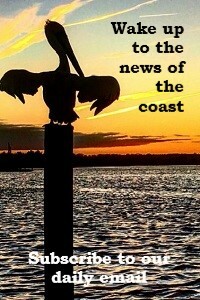 Murphey told Coastal Review Online in an interview that the Swan Island Oyster Sanctuary is a tremendous project. He said during the first year, the material put out would cover three Dowdy-Ficklen Stadiums, referring to the East Carolina University football facility. “To me the exciting part of this is the public-private partnership,” he added. “The habitat that this material provides is special. It’s a sanctuary, it’s not harvestable for oysters, but it does provide a lot of, not only oyster habitat, but finfish habitat and recreational fishing opportunities. It’s provided a lot of jobs already in the construction of it … it’s just a real win-win situation,” he said. 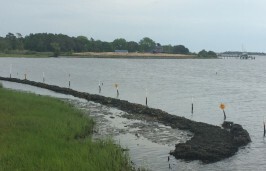 The Swan Island Oyster Sanctuary is funded through a grant from NOAA’s Community-based Habitat Restoration Program, and matching appropriations from the North Carolina General Assembly.